This Christmas was so wonderful! 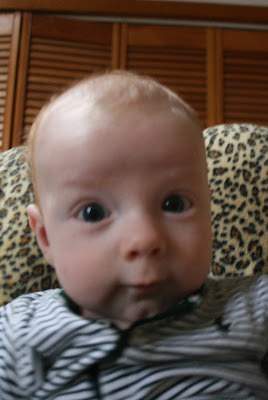 My sister came for a visit with her new baby and he sure is bringing a lot of joy to all of our lives. Such a cute little guy, I miss him already! I am kind of in disbelief that this was my last Christmas where I will be spending Christmas Eve night at my parent's house with my sisters. However, I keep smiling thinking about how next year will be our first Christmas together as a married couple... is it weird that I am already excited to send out Christmas cards with wedding photos on them? Anyhow, besides the adorableness of my nephew and amazing memories spent with my family this year, I recieved some gifts that were blog worthy seeing as they relate to the wedding! First up, my Mom gave me beautiful diamond stud earrings. I don't have a photo because I refuse to take them out (they're screw-backs so I'm slightly lazy) but man are they nice. They are .75 carat and I LOVE them! I had been wanting some diamond studs so I am very happy! 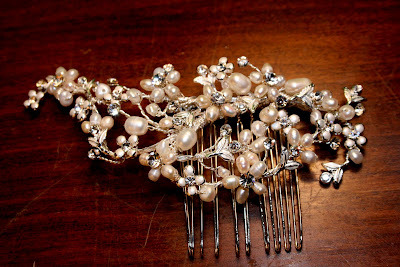 Then AJR ordered me a gorgeous hair pin that I will wear in my hair for the wedding. I may have dropped some not so subtle hints that I was in love with the hair piece so I was beyond elated that he did in fact get it for me! :-D It is from Etsy, made by Heart n Sole. This lady has a lot of beautiful pieces that I adore. But the one I got is definitely my favorite! It has ivory freshwater pearls, Swarovski crystals and rhinestones twisted in sterling silver wire. 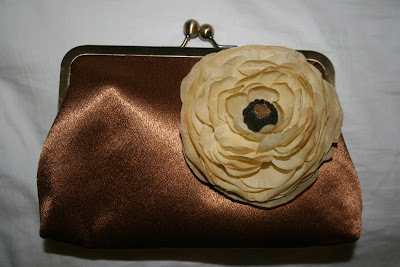 Then AJR's sister, Emily, gave me a very pretty and vintage inspired clutch that will be perfect to keep my little things in on the wedding day! So, my wedding day attire is complete! Now I take my dress to get a few more things added (some lace here, some buttons there) and I am done! Just need to start looking into hairstyles I want to try out with my beautiful new hairpin!